ORLANDO (WOLO) – Even if he wasn’t wearing his signature visor, even his choice of ballcap had a new logo for his new team apart of a new professional league, Steve Spurrier was back as the Head Ball Coach Saturday night and made a statement in his return to the sidelines. 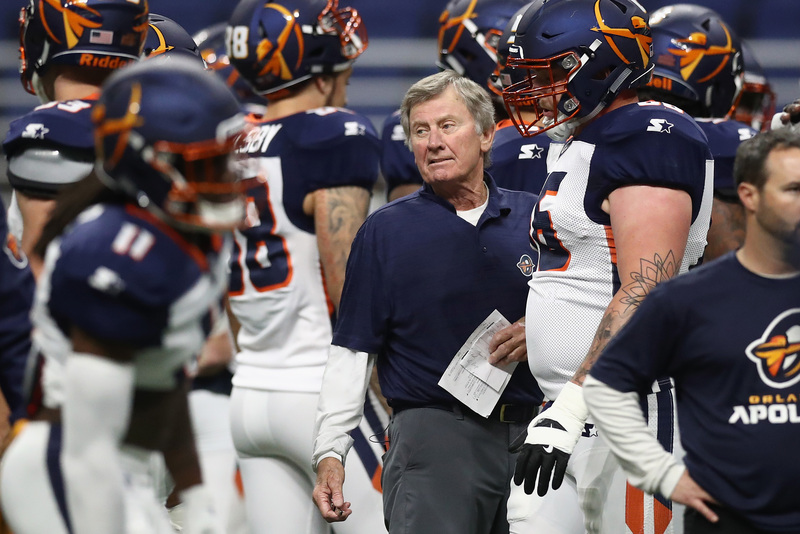 Coaching for the first time since October 10, 2015, his final game at Carolina, Spurrier led the Orlando Apollos to a blowout victory over the Atlanta Legends, winning 40-6 in the debut night for the Alliance of American Football. Former Gamecocks kicker Elliot Fry reunited with his former college coach, playing on the roster of his new pro league team. The all-time leading scorer in Carolina history converted a 33 yard field goal in his only attempt of the night. In the AAF, there are no kickoffs or point after attempts; every touchdown is followed by a two-point conversion. Spurrier’s imagination as a playcaller is one of his calls to fame, but it was his take on the Philadelphia Eagles’ “Philly Special” from last year’s Super Bowl that highlighted the night. The other highlight? Spurrier wearing a microphone during the whole game for the broadcast.